5. Makeup Geek Foiled Pan shadow in Grandstand - £7.95. The Younique Moonstruck Minerals pigment is my first delve into the brand, and I was lucky enough to receive it as a gift from the lovely Natalie, one of the Younique distributors, (or presenters as they are formally called). I usually steer clear of pigments as I normally find them too messy or fiddly to work with, but I was really pleasantly surprised with how silky the powder was, and how easy it was to get the right amount of product onto my lids! The colour is aptly named 'Beautiful', and is a sandy, warm toned brown, that looks perfect all over the lid and as a subtle crease colour. At £10 a go, they may seem quite expensive next to the Makeup Geek shadows, but there's so much product, I don't see this ever running out! If you're interested in purchasing any Younique products, please do go to Natalie's page as she's super lovely. 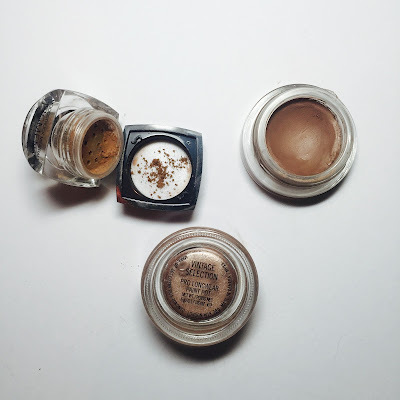 The Maybelline Leather Effect cream shadow is one of the more recent additions to the Colour Tattoo line, which I'm a massive fan of in general. 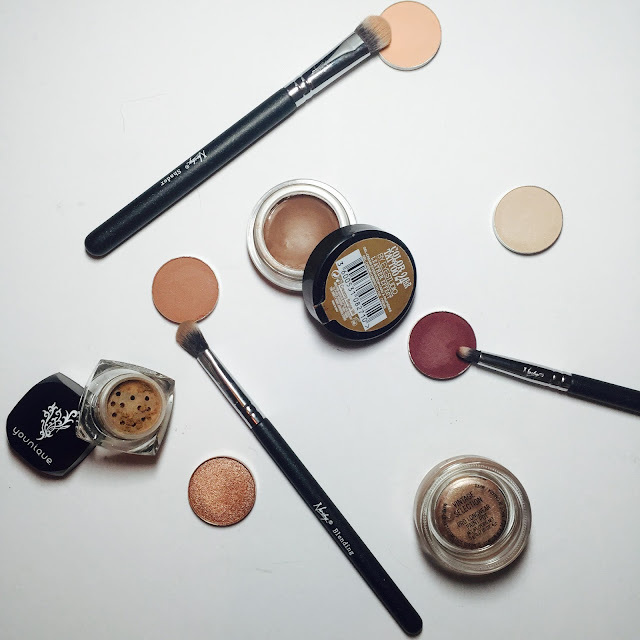 The formula of these new colours however is much more creamy and long lasting, so it's brilliant for days when I haven't got time for a full face of makeup, but still want a nice sweep of colour on my lids. Plus, it works best when applied with fingers so there's no brush washing to be done. Yay for lazy makeup days! 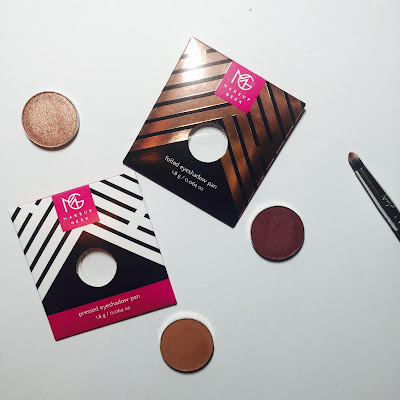 Makeup Geek eyeshadows are probably one of the most hyped-up products on the blogosphere. The brand was created by Marlena, a Youtuber, Makeup Artist and beauty lover herself, so I knew these were going to be good. Plus Jaclyn Hill has raved so much about them sooooo many times - well let's just say I didn't need much convincing to purchase a few shades from Beauty Bay a few months back. Oopsie! I feel like Jaclyn is to blame for my next choice of words, but these shadows are so buttery it is ridiculous. They blend like a dream, are so crazily pigmented and yet there's next to no fall out? Oh and at £5 a shadow (for the normal 'pressed' pans), they're really reasonably priced for the high quality you're getting. Amaze-balls. The lightest colour didn't show up brilliantly as a swatch, but its a beautiful matte highlight and brow bone colour; Peach Smoothie is a silky peach matte, the perfect transition shade for blending out crease colours; Frappe is a warm-toned brown, similar to but less ashy than the Maybelline cream shadow, and is a great crease colour for an every day look. Bitten is a beautiful cranberry shade that is surprisingly wearable, and yet really brings depth to a neutral eye look. Finally Grandstand is the most eye-catchingly shimmery copper colour, and one of the most pigmented things I've ever laid my hands or eyes on. If you do end up ordering any MG shadows, just try one of these and I assure you, you'll be blown away! Lastly, I have to give a little shout out to my Nanshy makeup brushes. I got the Masterful Collection as a Christmas present from my parents and I love how easy the brushes are to use, as well as being completely cruelty free and vegan! I actually find synthetic brushes the easiest to work with, plus they dry much quicker in between washes, AND no animals are being harmed in the process, its a no brainer really! I hope you enjoyed reading my makeup-related ramblings and I'd love to hear what eyeshadows you are loving right now! Maybelline Colour Tattoos are amazing! I'm not the biggest eyeshadow wearer, most probably because I am yet to master that haha, but the colour tattoos are so easy to work with. I haven't tried out the leather effects ones yet...creamier? longer lasting? I'll have to check them out!